Drizzle a cookie sheet with a little bit of EVOO and spread it out evenly across the surface of the pan. Arrange the sea bass fillets skin side down on the cookie sheet and season with some salt and pepper. 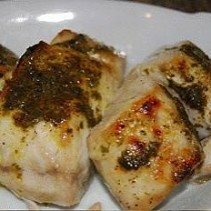 Give the top of the fish fillet a little drizzle of EVOO and transfer to the broiler, leaving about 4 inches between the fish and the heating element. Broil the fish for about 5-6 minutes or until cooked through. While the fish is broiling, make the herb butter and the salad: Place a small sauce pot over low heat and add the butter. Once the butter has melted, season it with a little salt and pepper and add the chopped herbs. For the salad, thinly slice all the radishes, arrange them in stacks and then thinly slice again, yielding thin little sticks. For the dressing, combine the shallots, sherry vinegar and some salt and pepper in the bottom of a salad bowl. Pour in the 1/3 of a cup EVOO in slow, steady stream while whisking to combine. Add the frisee and the radishes to the bowl and toss to combine. To serve, arrange the cooked sea bass on dinner plates and pour some of the herb butter over the top. Serve the salad and some crusty bread alongside. Thanks to Rachael Ray for this great recipe!